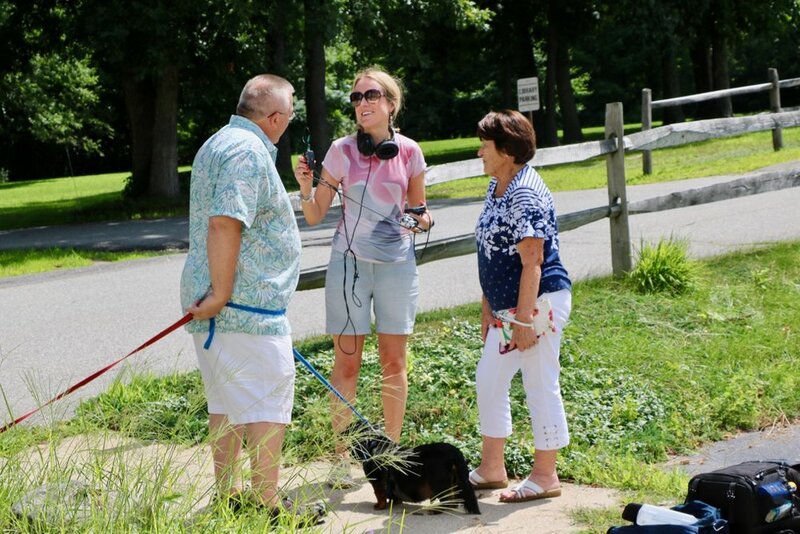 The worldwide historical significance of old Nutfield was made vivid once again by the visit of a film crew from Northern Ireland on August 9th and 10th, 2018. Production house Macmillan Media in Belfast, Northern Ireland, sent the crew to work on projects commissioned by the Ulster Scots Agency. That agency works to educate the world about and vigorously promote the importance of the Scots-Irish heritage worldwide. They have been instrumental in this year’s 1718 Migration activities—which mark the 300th anniversary of the departure of Rev. 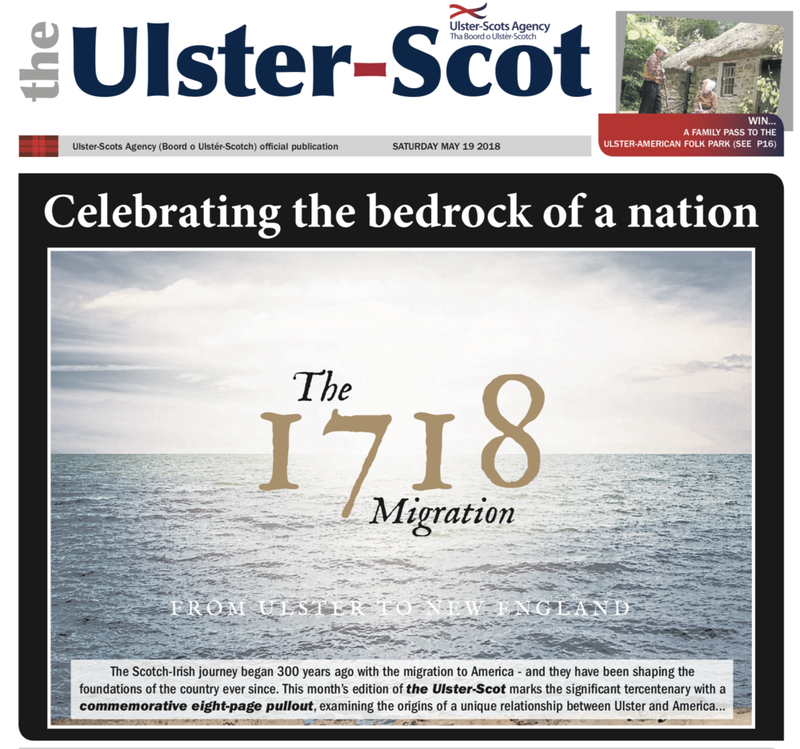 James MacGregor and other Scots-Irish early settlers from Northern Ireland—and will probably be helping with our own 300th anniversary celebration of the founding of Nutfield by those settlers next year. The visiting Macmillan Media crew included producer/writer/presenter Jane Veitch, and videographer/drone pilot Matthew Gould. 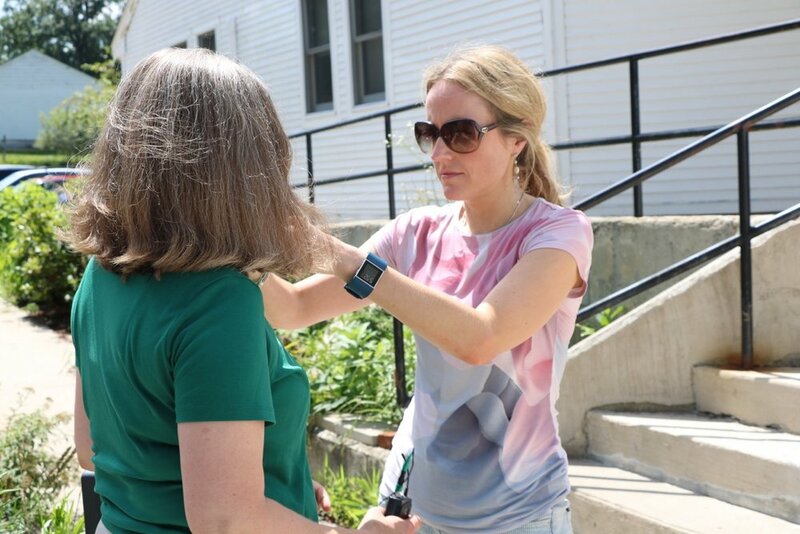 Arriving at Logan Airport Wednesday afternoon, they traveled to their temporary Nutfield home in the beautiful Stillmeadow B&B before spending two very full days of local filming (described below). On Saturday they headed up to Maine for filming of more northern Scots-Irish historic sites. 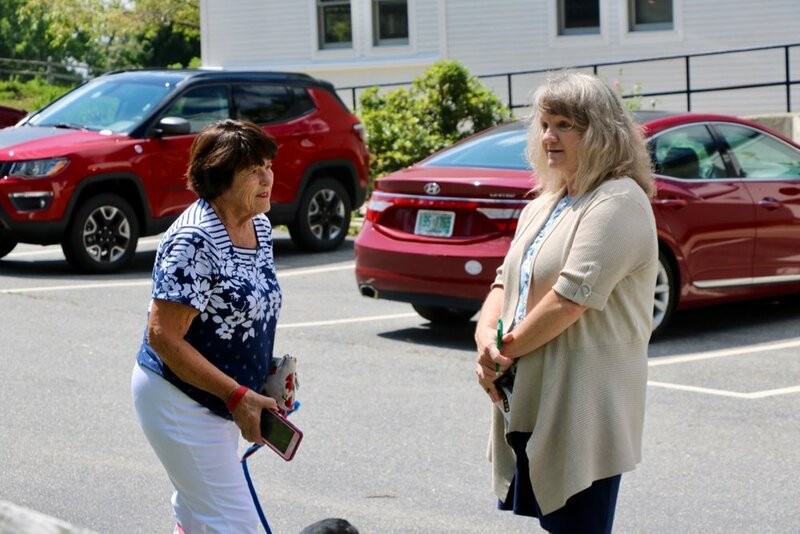 They also participated in the week-long international 1718 Scots-Irish Migration and Family Reunion conference at Bowdoin College conducted by the Maine Ulster Scots Project. 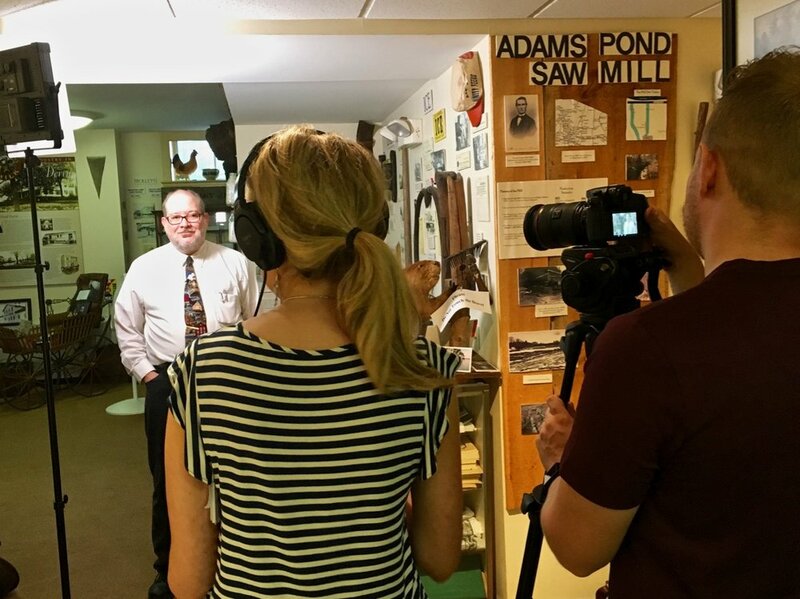 Jane and Matt were focused on capturing video of historic places and artifacts as well as doing interviews with local experts and descendants. Unlike other commercial filming outfits we’ve hosted, the videos they produce will be available to us as we work with the Ulster Scots Agency to spread the word of Nutfield and our upcoming 300th anniversary. We started Day 1 (Thursday) suitably enough with an introductory and planning meeting at the Meetinghouse. 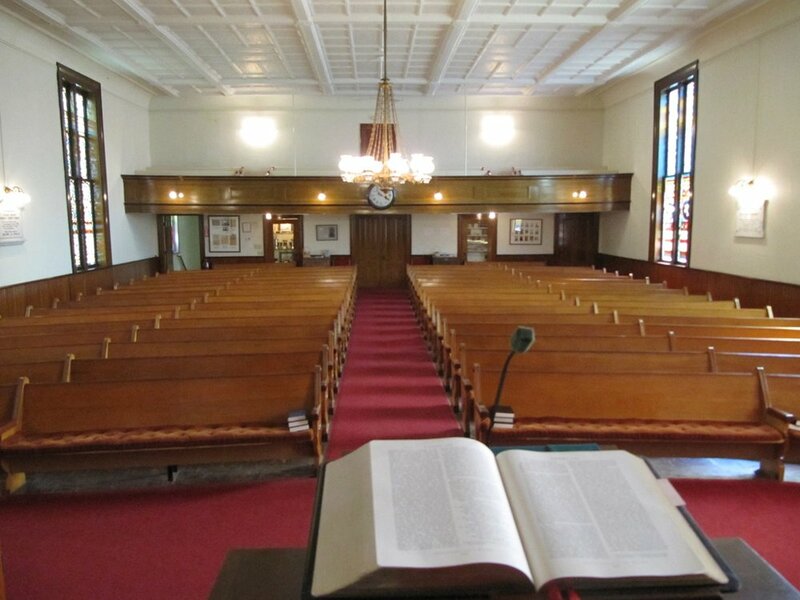 SInce its construction in 1769, this historic building has been the continuous home to the church community Rev. MacGregor founded. 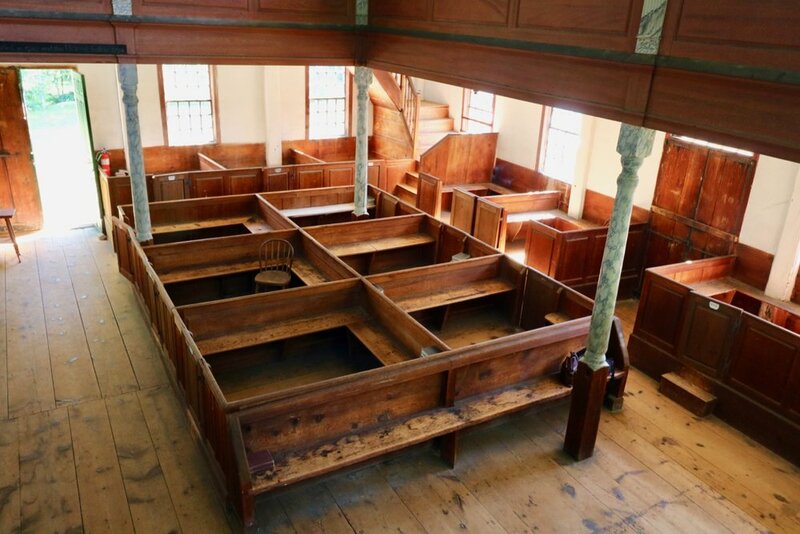 It’s the second First Parish Meetinghouse, built to accommodate the rapidly growing community’s civic as well as religious needs, and it has undergone significant changes as that community evolved. The Macmillan Media team got a tour and then filmed scenes throughout the building. The 1884 MacGregor family stained glass window in the Sanctuary was of particular interest. See the team in action—plus some other shots of the Sanctuary and exterior in—the photos. From the Meetinghouse on the hill we went down to the Derry Museum of History in the Adams Memorial Building on West Broadway. There curator Mark Mastromarino gave a tour of the Museum’s huge collection of reference-quality artifacts and documents which cover all of the community’s three hundred year heritage. He then did a gracious and informative on-camera interview, and with this first Derry interview "in the can" the crew was visibly excited about the sort of footage they would be capturing on this trip. Next we drove to the Derry Public LIbrary, which has been largely made possible by a gift from MacGregor descendants. 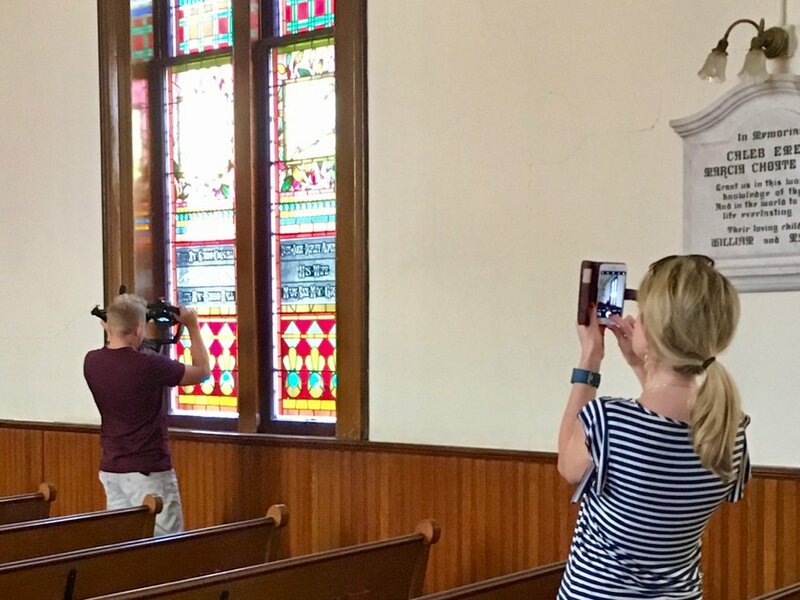 In the special local history research space—the New Hampshire Room—Matt filmed the MacGregor stained glass window while Jane was interviewed by reporter Alex Guittarr for the Nutfield News. 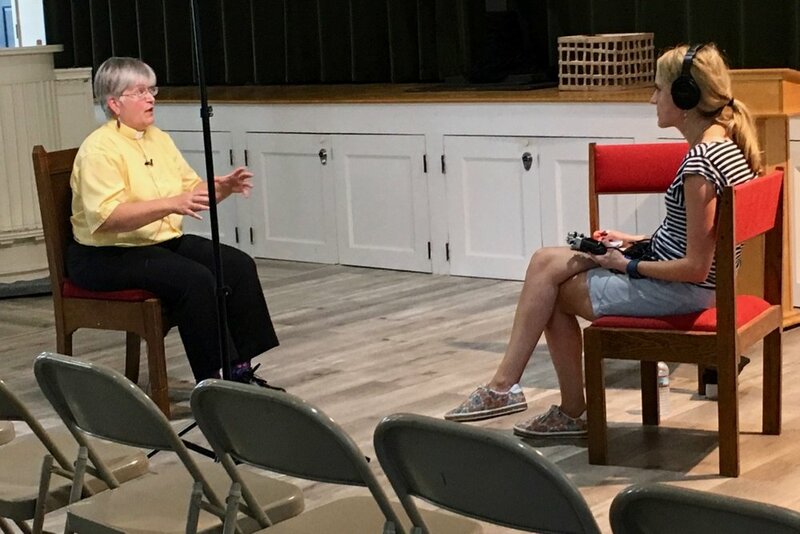 After lunch we returned to First Parish in East Derry to conduct an inspiring interview with the pastor there, The Reverend Doctor Deborah Roof. Then we packed up and moved just beyond the Meetinghouse and church facility to Forest Hill Cemetery, the final resting place of most of the First Settlers and the many generations to follow. The three-hour Forest Hill session concluded with Matt capturing some fantastic aerial footage using his DJI Inspire 2 drone. The First Sermon in Nutfield" from Willey's Book of Nutfield, p. 52. The site is on private property today, and we appreciate the owner giving us permission to film there. There is some debate whether the sermon took place right on the shore or closer to today's road. We chose to film at the more scenic shore location. Pastor Deborah did a very nice reading of Isaiah 32:2 KJV, the verse Rev. MacGregor featured in his sermon. Matt captured this from various angles, then got more beautiful drone footage over Beaver Lake as the sun began to set. 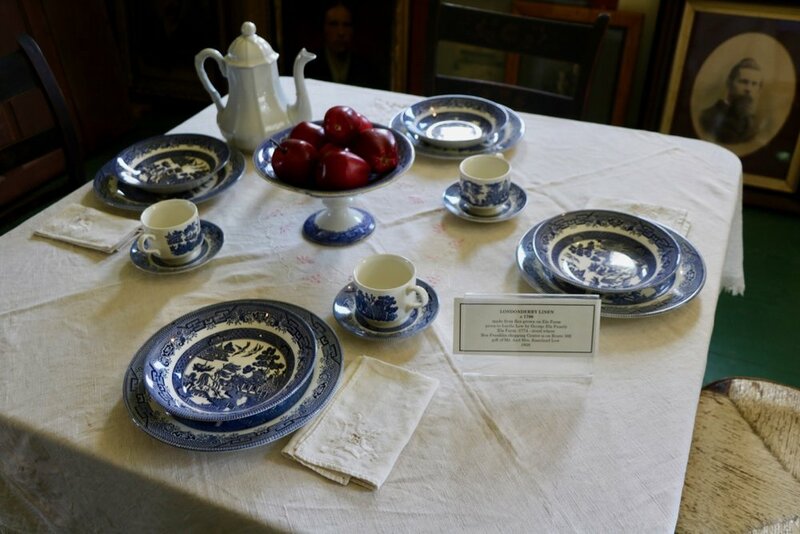 Society member and Morrison House Museum curator Ann Chiampa gave a wonderful tour of the Museum's collections and displays—which Matt then expertly captured—and sat for an in-depth interview by Jane. We stayed too long at the fascinating Londonderry site and rushed to meet several people for lunch back at First Parish in East Derry. 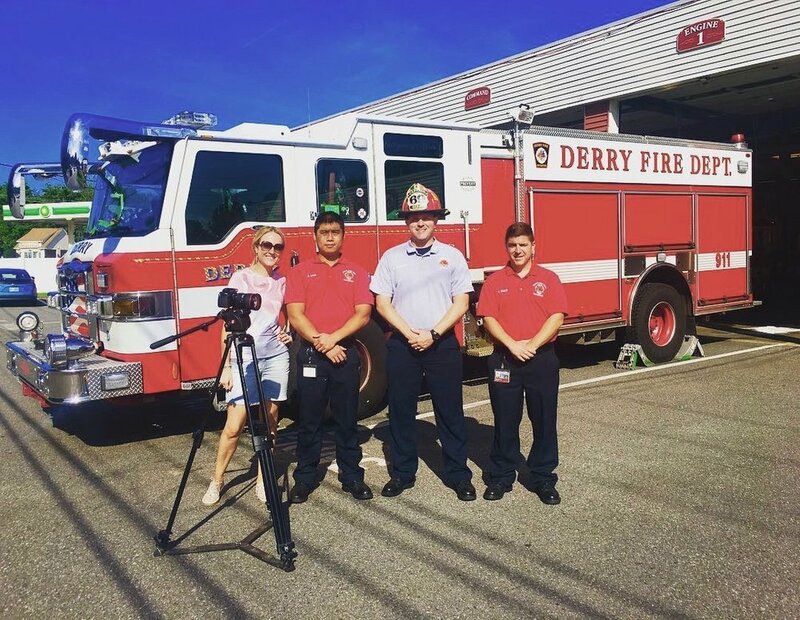 With pizza and salad from the historic East Derry General Store across the street, the crew conducted interviews with several local history volunteers (see the photos and Acknowledgements down below). We were thrilled to also have early settler descendants join us for lunch. James Scannan and his mother Josephine Eleanor Wiggin Scamman trace their family tree back to the Cochran and Wilson families, and traveled from Stratham, New Hampshire just for our lunch. 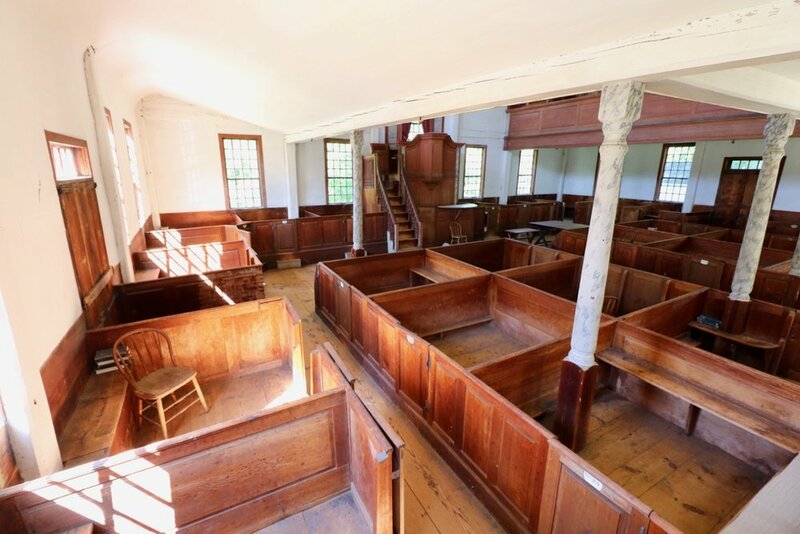 Our last stop with the film crew was a visit to the Old Meeting House in the nearby town of Sandown, New Hampshire. There trustee Arlene Bassett let us in and showed us around. 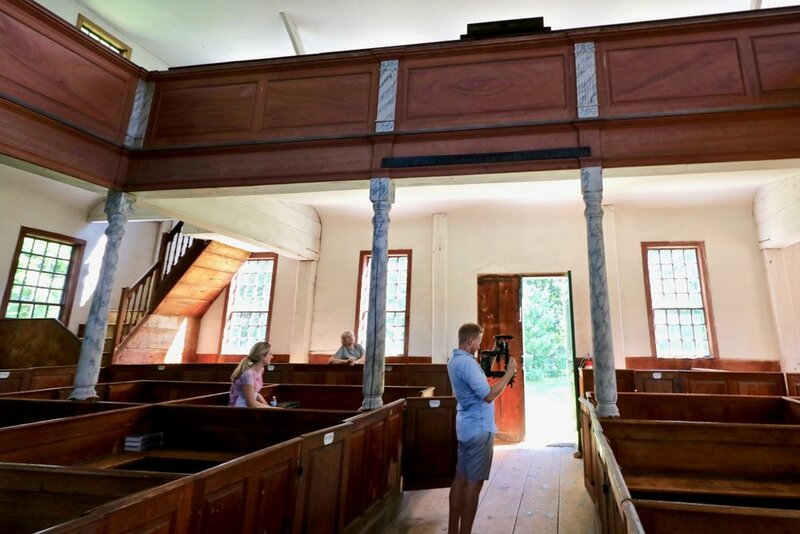 While not a direct part of the Nutfield story, this beautiful meetinghouse was built in 1774, just five years after the current First Parish building, and has remained nearly unchanged since then. 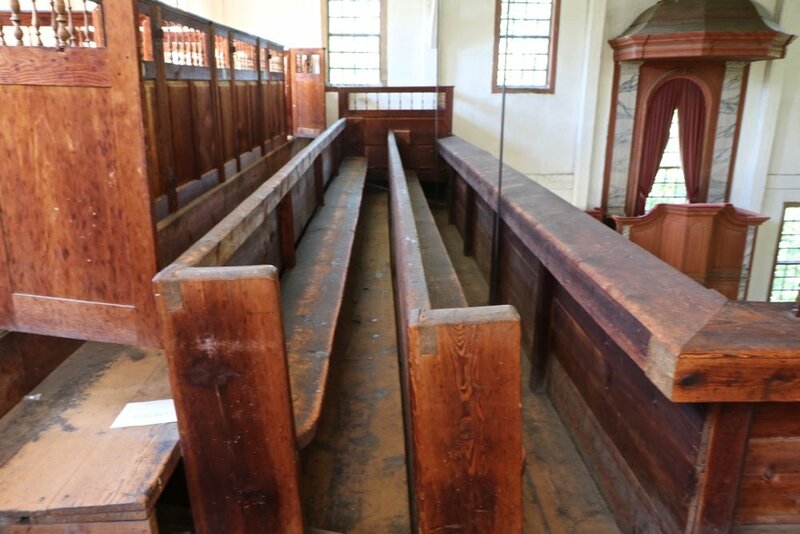 Stepping through the old door was a very inspiring experience, as the pulpit, galleries, box pews, and other interior features we've described so frequently at First Parish were still there to be seen. 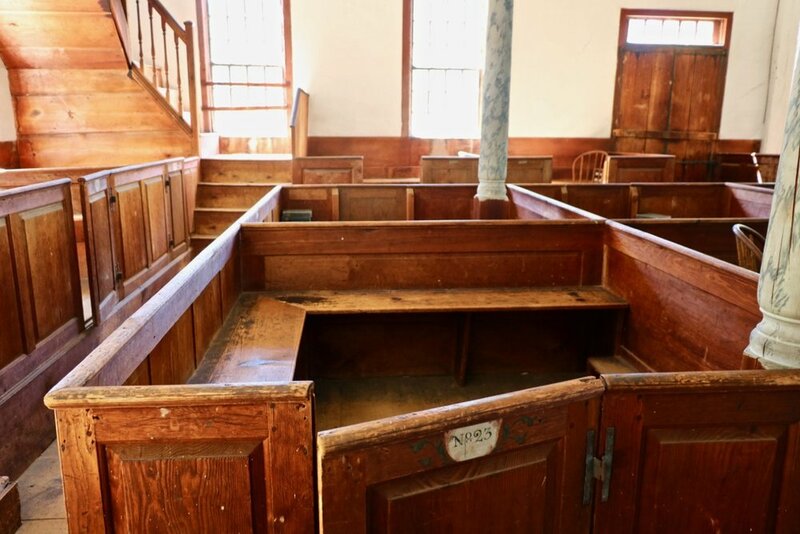 With the interior looking very much as first built, it was easy to imagine the people whose lives had been centered on this religious and civic structure. We'll provide more photos and compare the Sandown and East Derry meetinghouses in a future blog post. 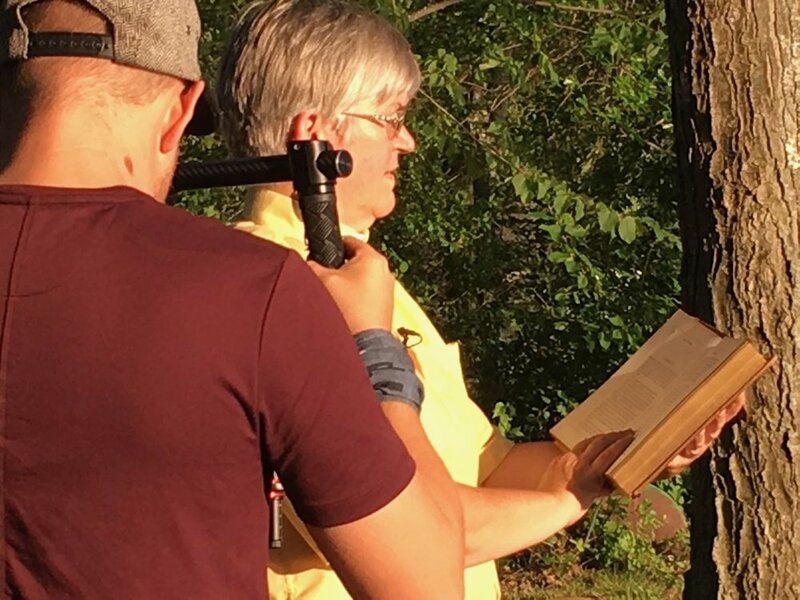 It was a pleasure working with Macmillan Media's Jane Veitch and Matt Gould, and we're honored they chose to film so much here in old Nutfield. We'll be sure to share their results locally once available. We also hope they are able to come back next year and help capture our exciting Nutfield 300th Celebration activities!